Representative Honours: Ireland: 6 Full Caps (1946-1948); Eire: 24 Full Caps/2 Goals (1946-1955); League of Ireland: Caps. Club Honours: (with Shamrock Rovers) FAI Cup Winner; (with Everton) Football League Division Two Runner-Up 1953/54; (with Cork Hibs) FAI Cup Runner-Up 1962/63. First capped by the FAI while with Shamrock Rovers, in a 3-1 defeat by Portugal in June 1946, Tommy Eglington arrived at Everton, along with Rovers and Eire teammate Peter Farrell, the following month for a combined fee of £10,000. He made his Football League debut in a 3-2 home win over Arsenal in September, soon establishing himself as one of the games most effective wingers, both fast and tricky. Also the possessor of a powerful shot, Eglington’s goalscoring prowess was never better evidenced than in a 7-1 Division Two victory over Doncaster Rovers in September 1952. 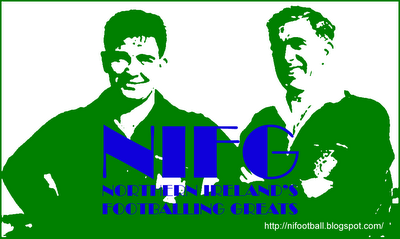 Awarded his first cap by the IFA in Ireland’s second post-war international, a 0-0 draw with Scotland at Hampden Park, Eglington remained a regular on the left-wing through to late 1948, his career for the ‘Northern’ Ireland team cut short as the border solidified in footballing terms. His Eire career spanned close to a decade and a total of 24 caps. He scored twice, most famously in a 4-0 victory over Austria in March 1953 that went some way to making amends for the previous March’s 6-0 humbling. 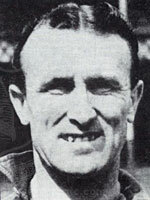 Eglington could do little to prevent Everton’s relegation on “goal average” to the Second Division in 1951; indeed his return of eight goals was a personal seasonal best up to that point. It took three seasons for the Toffees to bounce back as they finished as runners-up to Leicester City (again goal average did them no favours and cost them the title). By the time of Eglington’s return to the top-flight he had passed thirty, and his explosive pace had began to wane, his effective delivery however remained. He eventually left Everton in June 1957, moving across the Mersey to sign for Tranmere Rovers, where he was joined by Peter Farrell three months later. The highlight of his time at Prenton Park was perhaps a hattrick in a 5-1 defeat of Accrington Stanley in August 1959. 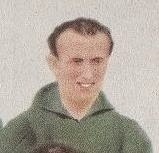 Tranmere’s relegation to Division Four in 1961 proved a sad end to Eglington’s Football League adventure, and he returned to Ireland to play out his career with Cork Hibs. He settled in his native Dublin, where he ran a butchers shop, and died in February 2004 aged 81. Summary: 6/0. Won 2, Drew 2, Lost 2.